Not only did we find the colors that we used for this project, True Turquoise and White on White, but we are planning to use Misty Aqua on our next project. Talk about killing two birds with one stone! 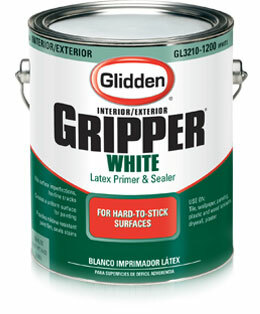 We started with the Gripper White Primer to help cover the dark paint color. It also is good at filling in some of the surface imperfections and gives you a nice uniform painting surface. Not to mention it makes the paint color you choose look more accurate on the walls. Another great benefit is added mildew resistance, which comes in handy in a bathroom. 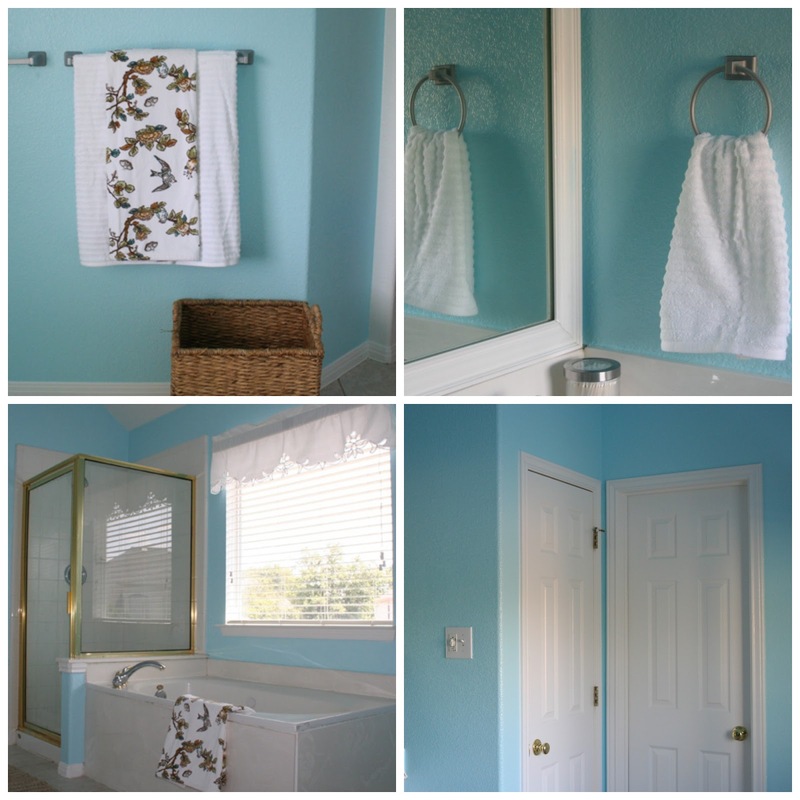 We then painted the ceiling White on White, and worked our way down to the walls with True Turquoise, then finished up with the trim, also White on White. We still have plans for the room, like replacing the gold trim shower, but I really wanted to show what a difference can be made with just paint. I often put off starting a project because I feel like I have to be able to afford to do everything I want to do in that space before I even start. In reality, that could mean waiting years to redo a bathroom that could cost upwards of $30,000 to remodel. Instead, I started with the wall color, which made a dramatic impact. Painting the trim and doors made them look brand new! I even reused the same towel holders and just used spray paint to turn them from gold to brushed nickel (a trick I might try on my shower too). Now I can enjoy a bathroom color that I love and can continue to save for the the bigger projects. BlogHer, Inc. is soley responsible for all aspects of this My Colortopia Sweepstakes, including without limitation the administration and fulfillment thereof. Do you have a room you have been putting off painting because you haven't been able to choose a color? Answer this question in the comments section for a chance to win a $100 Visa Gift Card! 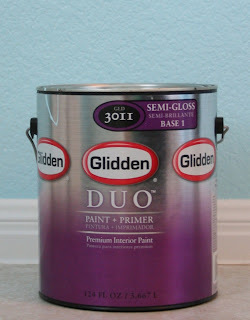 This post is sponsored by Glidden paint, but all thoughts and opinions are my own. No duplicate comments. You may receive (2) total entries by selecting from the following entry methods: Leave a comment in response to the sweepstakes prompt on this post Tweet (public message) about this promotion; including exactly the following unique term in your tweet message: “#SweepstakesEntry”; and leave the URL to that tweet in a comment on this post Blog about this promotion, including a disclosure that you are receiving a sweepstakes entry in exchange for writing the blog post, and leave the URL to that post in a comment on this post For those with no Twitter or blog, read the official rules to learn about an alternate form of entry. This giveaway is open to US Residents age 18 or older. Winner will be selected via random draw, and will be notified by e-mail. You have 72 hours to get back to me, otherwise a new winner will be selected. The Official Rules are available here. This sweepstakes runs from 7/8/2013 - 9/30/2013. Love, love, love the transformation! We striped our hallway a few weeks ago and I am. in. love! Great job!! Wow! What a change! Love the soothing blue! Yes, our sunroom. We need new flooring in here first! That looks so good!! No clue what to do in my family room!! It's so big and it includes the kitchen! We have been putting off painting our bonus room because my husband and I disagree about the colors. He wants a light color and I want something darker. I need to paint my master bedroom but having trouble picking a color. Don't want to go too dark to make it look smaller. Thanks for info on Colortopia. And for chance to win. I cannot decide what color to paint my family room. Right now, it is a hideous cotton candy pink. It doesn't match anything. I am torn between a grayish color and a taupe color. I'm in the middle of painting my kitchen right now, including the cabinets and a LOT of trim. Joy. I hate to admit it but my home needs every room but the master bath painted. I have ideas about stripes in the bedroom with the same color but using flat and eggshell finishes for the slight contrast/interest. cannot make up my mind if I want vertical or horizontal. My mini kitchen needs some pizzazz but shades of gray would make my hsb happy. I'd love to give my master bedroom a little make-over with a new coat of paint! Yes! My living room. It's a lavender grey right now. I'd like something different but can't figure it out. I'd like to paint my daughter's room but this issue isn't what color to choose (some kind of light blue), but how to move her bed! Within the last year, we have repainted nearly every room in the house...except the master bedroom because we could not decide (or agree) on a color that we would both want to live with every single day. I change my bedspread often, so I am afraid of picking a wall color that would limit my options for bedspreads. Basically, I am too indecisive and I don't know if I will ever settle on a color...so either my walls will remain white, or I will begin changing the wall color as often as I change my bedspread. First: I have seen people paint the shower enclosure trim with great success. I have been putting of painting every room of the house. Seriously. I went (more than once) and bought the same color the builder used so I can do touch up to the cheap paint they use. It's a fine ivory color, but my gosh if you look at it, you leave a mark. And you can not wash anything from it. I have also bought black paint to do all the doors. That was... many months ago? Maybe a year ago? But I haven't cracked open the can yet. Then, two weekends ago, three? I went and bought paint to do... the laundry room. But I haven't cracked that can open yet either. I'm such a fraidy cat. I have been putting off painting our master bedroom because I haven't been able to choose a color. I really must paint my bedroom. We moved to this house two years ago and it is still the same taupe the former owner left it! I would love to have it all decorated and my style. 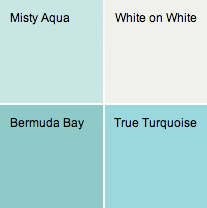 Yes, I have been wanting to paint the family room but I can't decide between 3 colors. My husband is no help, he likes all 3 colors. I want to paint my dark bathroom. LOVE the color you chose Lorie! (May need to steal it!) I'm in an endless debate over what color to paint the kitchen. I can't decide what color to paint my master bath. Our bedroom is gray and I need to find a color that flows with that, so it is still builder beige until I can decide. I'd love to paint my daughter's room! Oh yeah...my little boy's bedroom. He loves blue but I don't want to make it looks sad or too dark. This sounds like a fun and helpful tool to use. Thanks for sharing. I love the color that you pick! The bathroom in my basement! Absolutely love your changes. Now if you could just come over and help me decide what to do with my living room. It needs a drastic change. I would like to paint my kitchen. I need to repaint my bedroom! I would like to paint my bedroom. It's all white and has not been repainted since we first moved in 21 years ago. A touch of color would really bring it to life. Although I can't decide on a color. I would like to paint my bathroom. My bedroom hasn't been painted in years. It needs an update. I really need to repaint my kitchen!